Make popcorn using a popcorn maker or microwave oven. Take sugar into a mixie jar and grind to make powder. Add grated jaggery to the powdered sugar in mixie jar and grind well. Transfer the prepared light brown sugar into a bowl. Heat a wide and deep big pan and add prepared light brown sugar, melted butter and cook stirring till sugar dissolves completely. Add milk and cook till the mixture is slightly thick. Switch off the flame and add vanilla essence and baking soda and mix well. Observe that the syrup is foamy now. Stirring for a while allow the syrup to cool slightly---by that time it starts thickening. Add the prepared popcorn and mix the entire mixture using two flat ladles so that all the syrup is evenly coated on all popcorn pieces. Once syrup is fully coated on entire popcorn and the sugar starts crystallizing, transfer the popcorn into a tray and spread in a single layer and allow to cool completely. Store the prepared caramel popcorn into airtight jars and store and serve as and when required. While making popcorn observe that some corn remains as they are and are not popped---remove such corn before adding the popcorn to syrup. Brown sugar is not easily available in India and is expensive where it is available. So make your own brown sugar as mentioned above and it tastes excellent with the natural flavor of jaggery. Keep two ladles and a tray ready before making syrup as one needs to work fast while mixing popcorn in the syrup. When baking soda is added the syrup starts foaming vigorously---so it is advisable to use a deep pan. 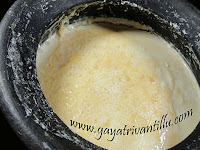 If syrup is made in a wide and deep pan (PEDDA MOOKUDU) then it would also be easy to mix popcorn once syrup is made. 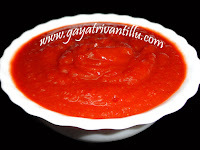 After adding baking soda mix well and stir the mixture for few seconds so that the syrup cools slightly. But remember to add the popcorn while the syrup is still in liquid state and not got crystallized. Once sugar gets crystallized it would not coat the popcorn. So cool the syrup slightly but do not cool the syrup to the extent that it gets crystallized. Cool the caramel coated popcorn completely before storing.